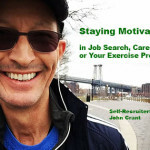 Staying Motivated: in Exercise, Job Search, & Career! It’s easy to get excited about our career or are job search for a few weeks at a time. The same goes for a new exercise regimen. This week I’m celebrating the one year anniversary of implementing an intensive cardio program. And, I have a confession to make: it’s the first time in my life I’ve done cardio on any type of consistent basis. I don’t take pride in that statement, but just as in managing our job search or career, the truth about our efforts is most important. Yes, many may see me as very lucky, as I’ve always been a ‘skinny’ guy. And while that is a blessing in so many ways, it can also be a burden to carry in the earlier portion of our life –as expectations in our society set quite a different visual as the goal. Always having fought to add the right amount of weight in muscle form so that I might be ‘presentable’, lol, I never focused on cardio, only putting my attention toward machines and free weights. Beginning last year in February, I charted a new course, deciding that if I was going to ‘take control’ physically and live the second half of my life with as much excitement and energy as I envisioned… then I also had take to take control of my true health lurking beneath the exterior that seemed just fine. It’s a similar challenge when looking at our career, or even our job search –if we happen to be looking for new seat at the table. It’s very easy to look at the exterior of our career as comfortable; not so bad; in line with what we may see around us. But, is that really how we envisioned our career when we were still filled with inspiration so close to the surface and with our desires? Does that fulfill the hopes dreams and aspirations that we may have thought of when imagining our journey through the workforce? One day we may wake up and realize that we can’t expect different results, unless we take different actions. Last February was quite cold and snowy, so to me it was the perfect time to start my cardio program. In the past my efforts never lasted because I hated being on the ‘machine’ staring at the television, often wondering, “Just to it was that selected ‘this’ channel that I happen to be looking at on the television?” Most often I would watch the clock hoping and praying that the 20 or 30 minutes might pass, eventually giving up and deciding that it ‘was enough’ for that day. We will never reach your fitness goals with just 20 or 30 minutes commitment, let’s get real. And without proper focus on our career, or are job search, it’s very unlikely will ever reach those goals either. 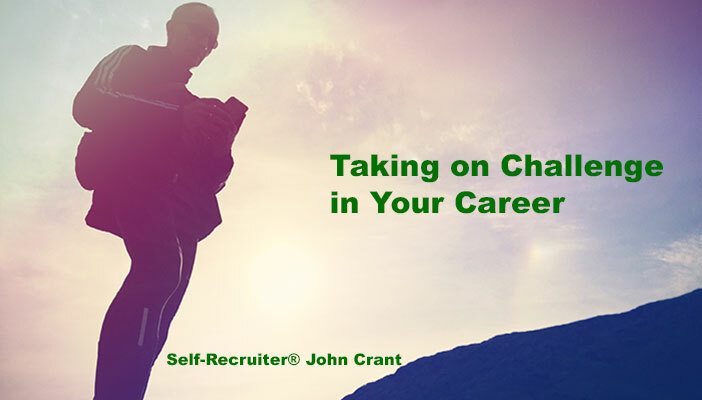 It’s the subtitle to by book: Self-Recruiter®: Changing the Rules. My change involved buying a pair of running tights for the first time in my life, and taking my exercise outdoors along the waterfront Manhattan. Yes, I’m lucky to live just a short walk from the waterfront, and instead of staring at that television waiting for the time to pass or for ‘enough time’ to pass that I could walk away for the day, now I use a physical course so I just can’t ‘cheat’ the effort. 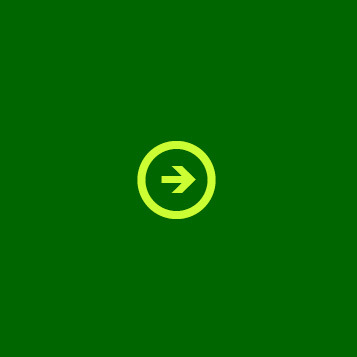 Cheating the effort in our job search, is sitting on the Internet looking for job postings imagining we’re going to find those greener pastures that we seek. It takes real effort to achieve your goals. My cardio plan: 4 1/4 miles per day speedwalking (running is not so good on the knees and joints), 3 to 4 days per week. Rain, Shine, Sleet, or Snow. That’s whether it’s 15° or 85°. And I supplement those goals with hiking each weekend, typically 3 to 6 miles depending on the rigors of the course, within an hour or two of New York City. To clarify, that speedwalking is a very fast walk… nearly as fast as is possible, typically coming in at about 13 minutes-per-mile, ending each of those walks by climbing eight flights of stairs (rather than taking the elevator). Another confession, acquiring an Apple Watch at the end of last April has certainly helped me stay motivated, and connected –even while staying on plan. Your job search plan, or how you plan to manage your career takes a significant investment of time, strategy and energy. As a public speaker, who may have 11 events within a single month, in addition to my one-on-one client work, I have a very full schedule and little time to devote to this amount of exercise. Not dissimilar from what I hear from those in their career, “My job is just too demanding. I’m just too busy. I wish I had time for this.” Without commitment and change you’re not likely to reach your goals. Several amazing benefits have come out of this new cardio program. My energy levels have skyrocketed, though few that have seen my lectures would ever accuse me of being low energy. My feelings of well-being and peace have skyrocketed. My confidence, especially in tights, lol, has skyrocketed. And I lost 20 pounds of fat in the first four months –which I found astonishing since I was already skinny. As we age, or at anytime in our lives… who really needs that extra fat, so that was quite an unexpected benefit in my case. When you decide to take control of your job search and career, and invest the consistent focused energy necessary, while also juggling all the other priorities in your life and career, you too will see unexpected benefits that you could not have imagined. Benefits that will change you and may even change the way that you do your job. Benefits in how you feel about what you have to offer. And benefits in understanding your true value to your current or potentially future employers. There are only two reasons you ever get hired, assuming you’re capable. If you’re capable for the jobs that you are pursuing, then it always comes down to chemistry #1 above all other things and #2: confidence above all other things than chemistry. That’s before credentialing; before who you’ve worked for; before any other piece of your background or individual accomplishments. It was difficult last February to take that first step out of that door… what will people think? “Wow, there’s someone that’s committed.” Or, they’re someone that ‘should be’ committed! The reality is, only one opinion matters: your very own. Take ownership of who you are; what you bring to the table; and the course you set for your future. Today is the day: seize the challenge and take your first steps. And, then the next. And the next. And the next –until you find yourself in quite a new place, which maybe the very top. 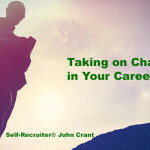 If you need help getting your change in motion: the new Self-Recruiter® Job Search & Career Boot Camp starts Feb 21st. I read this article and found it very interesting, thought it might be something for you. The article is called Staying Motivated: in Exercise, Job Search, & Career! and is located at http://selfrecruiter.com/2015/07/20/2-hours-to-an-effective-job-search-as-quoted-by-the-wall-street-journals-career-website-fins-com/. As seen and quoted in The Wall Street Journal, on FINS.com, on CareerBuilder’s CBsalary.com, on The Ladders, in The New York Post, The Huffington Post, in Essence magazine, in CRAIN’S New York Business, on Forbes.com, in amNY, and on CNN, BBC, FOX News, Arise TV – John shares the answers and the concrete steps for success in Job Search. 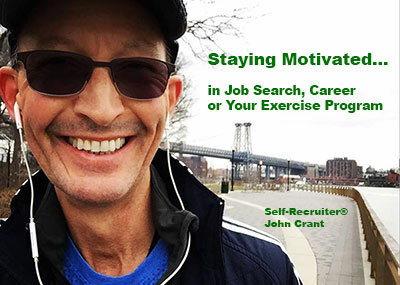 John is a Featured Speaker at The New York Public Library’s JOB SEARCH CENTRAL, as well as at the YMCA in New York City, and is a Social Media expert for Goldman Sachs 10,000 Small Businesses Program. He speaks at Corporate Events, works with Workforce Development organizations, and teaches both students and alumni with this Self-Recruiter® Series for Colleges and Universities. Ride the Economic Crisis to Your Next Career Challenge. Running in Place during our Career –And getting nowhere! Hope and fear are often two sides of the same coin. One side tells us to do the best we can in our profession, and people will notice. The other side tells us it safer to wait to be recognized for our good works, than venture out into the unknown –with fear keeping us steadfastly in place. It can be very much like that little metal wheel with the rodent. Going round-and-round, faster-and-faster, seemingly with no end and no destination. Does that sound like your career? Why is it fear has such a powerful hold upon us? Why is it we’re so filled with hope that someday, certainly, someone will notice our great contributions –and we’ll get that promotion, or raise, or extra vacation that we deserve? I work with a great many job seekers, and those actively working in their career, and each of them faces this similar dilemma: should I stay or should I go? Should I take a risk? Is it worth the risk? The very definition of insanity in terms of career, is to stay stuck in place expecting different results. Charting those first steps forward after having been frozen in place can be a fearful daunting task. Similar to a time years ago when I found myself in Yosemite Valley in California, camping at the base of Half Dome, the park’s most photographed feature. I set out to conquer the very top, the story of which you can read more about in the last chapter of my book which is the motivational component to my job search step-by-step guide: Self-Recruiter® Changing the Rules. We have to change the rules. We have to take risk. Without risk there is little reward, but I’m talking about measured risk not carelessness. Looking ahead to the challenge, yet not allowing the fear to keep us frozen in place. To look just a step or two ahead, representing a challenge that we can take on. Then, from that new place, taking the next step, and the next step, and the next step. Until one day, we find ourselves in a place we may never have imagined: the very top. Reinventing your career, whether that’s taking it to a new height within your current area of expertise, or venturing into an an entirely new direction, is a similarly scary undertaking. In the 9 or 10 different lectures that I give on job search and career management, I always encourage audience attendees not to be blinded by the sight of the mountain, but simply to look at one or two steps ahead, and begin the journey. After all, the hardest part is taking that first step. So, what are those first steps to help you reinvent your career? 1) Look back with fondness on your expertise, and retell the best story of your career accomplishments to date. 2) Translate those ‘best parts’ of your background, contributions and achievements into a new telling that is compelling –on a single sheet resume. But, we do have to start with the goal in mind. Are we looking to reinvent and grow our current career? Or, venture into a completely new direction? The answer to those questions will determine our next steps because we need to get the reader of either the resume or our LinkedIn profile to see us as the ‘right’ next candidate for our destination. If our goal is to grow the current career, the reader must begin to see us as we see ourselves, understanding that we are the higher-level candidate they seek. If we are looking to transition into a completely new area, the reader must see the transferable skills combined with our passion and strong focus for this new direction. That’s how you begin to outmaneuver those folks that may have cookie-cutter background for the field that you would like to venture into. But, it begins with the first step. Take your first step, then the second step, and then all the steps after that. Become excited once again for what you offer your current or potential future employer –and chart your own destiny. If all this is still too scary for you, maybe the solution is to join a Job Search or Career Boot Camp. A structural framework that can help you, step-by-step, begin to navigate and take on the individual challenges necessary to move closer to your goal and to stop being frozen place. If that’s the right step for you, check out my website as I have a new Boot Camp beginning in just a couple weeks. If you’re looking to go in a new direction, and need further inspiration, check out my lecture on Reinventing Your Career & Making Your Move in Today’s Marketplace. I read this article and found it very interesting, thought it might be something for you. The article is called Running in Place during our Career –And getting nowhere! and is located at http://selfrecruiter.com/2015/07/20/2-hours-to-an-effective-job-search-as-quoted-by-the-wall-street-journals-career-website-fins-com/.